The Daily Clog » This Week’s Sign of the Apocalypse: A Freeway Closure … in L.A.! This Week’s Sign of the Apocalypse: A Freeway Closure … in L.A.! In a bold move to massively inconvenience millions of Californians while also potentially causing wide-spread panic and chaos, the city of Los Angeles has decided to close a major section of one of its most driven-on and most complained-about freeways, the infamous 405, for an entire weekend in July. 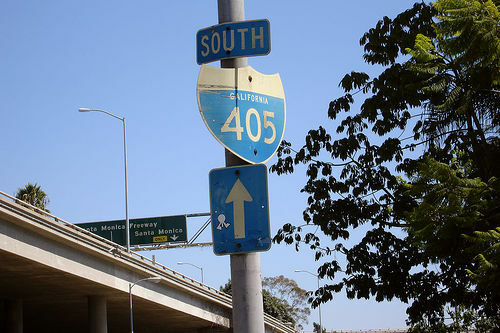 The 405, which is a bypass of the 5, begins in the San Fernando Valley and travels through such wonderful and celebrated locales as Torrance, Carson, Lawndale and Fountain Valley on its way to re-connect with the 5 in Orange County. The ten-mile stretch due to be closed is mostly part of what is known as the Sepulveda Pass, which connects the San Fernando Valley in the north (Sherman Oaks) with West L.A. (Santa Monica, Brentwood, Westwood) in the south. So for you SoCal Berkeley students back home with your families this summer, BEWARE! Our recommendation: stock up on supplies and stay indoors like these folks. For everyone in Berkeley, remain on high alert. We have no idea how out of control this thing will get. Aw man. Come on!! Was gonna record some stuff man! Keep up the good piece of work, I read few articles on this website and I conceive that your website is real interesting and contains lots of good information.